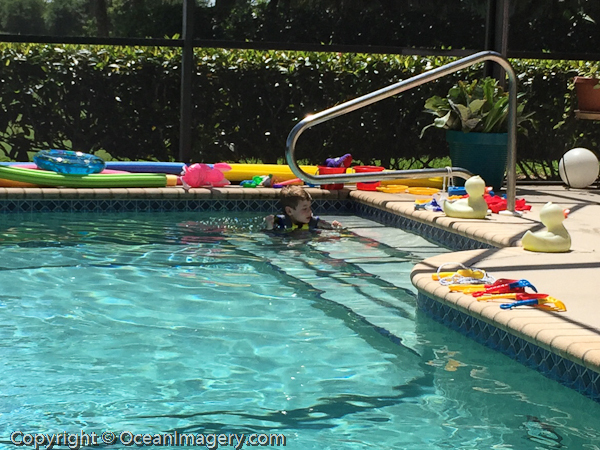 “Dylan spending way too much time in grandpa’s swimming pool” – West Palm, FL. Here are some photos from our 2015 trip to West Palm, Florida for our long Easter Holiday weekend. This year, as we do every year, we spent a nice restful long weekend with Julies parents at Harbor Ridge Country Club for their annual grand parents & grand kids weekend gala. This year Dylan was old enough to ride on some of the more advanced rides and even went on a long zip line with me! I have a video of that I will post later. The food and the fireworks show where the highlights for me, but I think grandpa’s swimming pool was the highlight for Dylan.